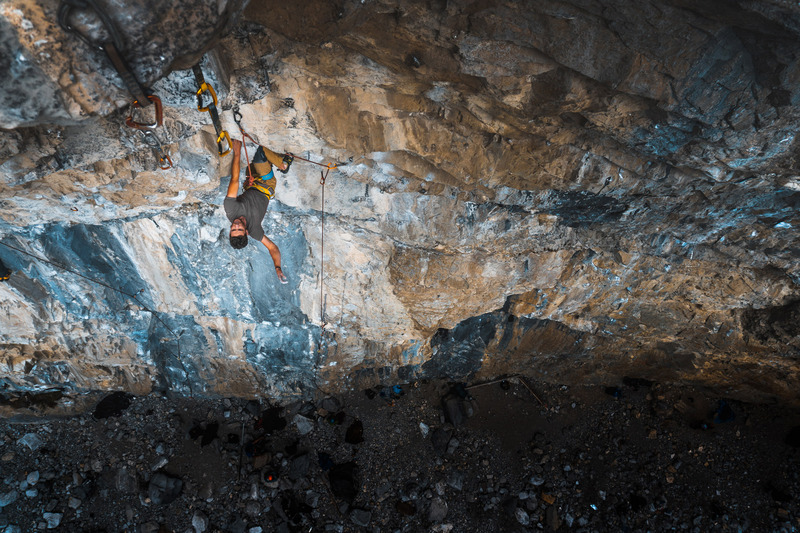 Last year, I committed to putting more effort and more of a focus on my climbing photography than in the past. After a number of years with just a cell phone, I finally jumped back into the photography world and purchased a Sony a6300. I also started bringing my Jumars to the crag every time I went so that I would have the option to take some shots from above. Climbing photography, as it turns out, can be quite a bit of work. This is multiplied by the fact that I made myself a promise to always either send something, or at least make a couple of hard attempts before I picked up the camera to shoot. 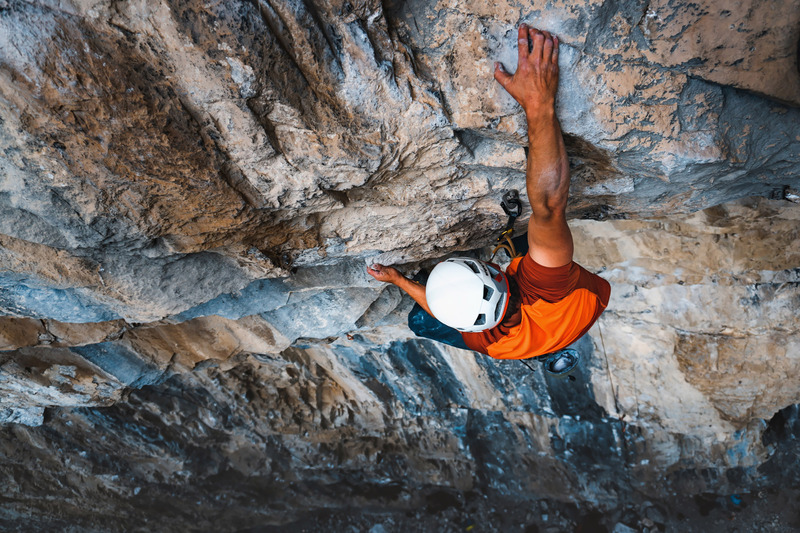 This means that after a number of hard tries on the project, fixing a rope on top of something, it was time to hop in the belay seat and jug up the rope to get a better angle on the wall. But the persistence paid off. 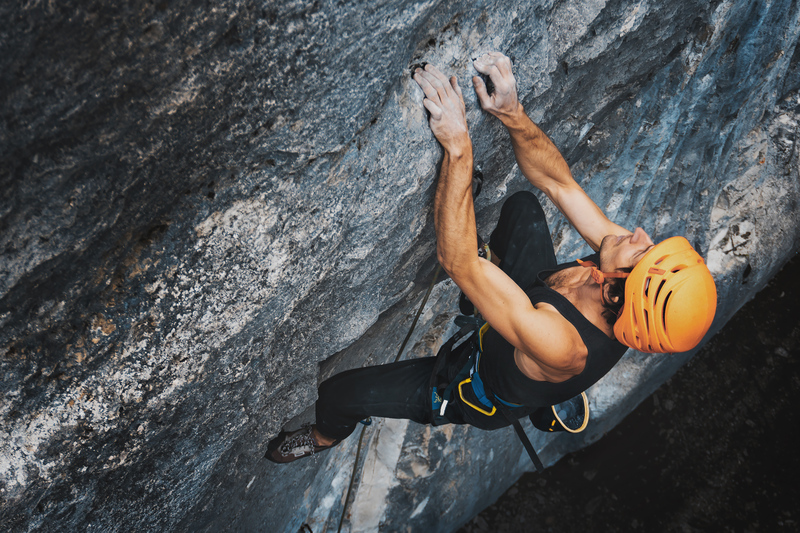 I learned a massive amount about the process and techniques for shooting climbing photography. I figure maybe around 99.5% of the photos I took were more or less derivative garbage. But fortunately, a couple of those derivative garbage shots ended up being something I felt somewhat proud of. More importantly, the relationships I was able to foster, and people I spent my time climbing with were the biggest inspiration of all, and by far the best part of the whole climbing experience. Here is a small collection of a few of my favorite shots from 2018. I’m especially stoked because I also sent, or at least attempted all of the routes in this collection (except Cosmos, maybe next year 😉 ) which makes these photos a little more special for me. Francois Beargeron is one of those guys that just lives and breathes climbing. Working as a wind turbine technician doing high angle access maintenance, he works for a number of months every year, and then spends a good chunk of the rest of his year climbing all over the world. Not a bad way to set up your life if you ask me. 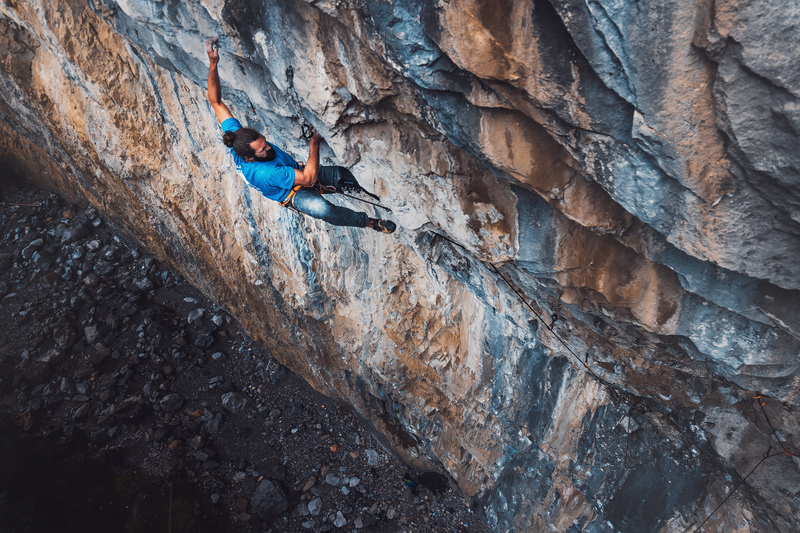 This year he sent his first 5.14a, a pretty notable achievement for anyone, and particularly impressive for a big guy like Francois who’s built a little bit more like a body builder than a sinewy climber like Alex Megos. Either way, Francois crushes it, all the time, and is one of the nicest guys you will ever meet, bar none. Francois working out the beta on “Cosmos”, (5.13c) at Planet X, which he subsequently sent a few days later. Pete Rochacewich (like his older brother Nick) is an off-the-couch beast. I was pretty grateful for a few days I had last year with him at the crag. One day, another friend (Kevin), Pete and I wandered up to the Hideaway at Echo Canyon with no intentions other to just have a good time, and maybe try a couple routes. This crag is packed full of extremely high quality routes, mostly in the 5.11 and low 5.12 range. Pete, not feeling 100%, still managed to pull out a second-go tick of “The Diamond”, one of the nicest routes on an already awesome crag. I also managed to snag a tick of the route second go, and Kevin (who had never climbed a 5.12b before) sent it a few days later on another attempt. Some days, the ones with the lowest of expectations… those turn out to be the best ones. 2018 was most definitely a year of firsts for not only myself, but for a whole bunch of the most important people around me. Jolene, my partner in life and in climbing, had her very best season ever. Going into 2018, she had never done an outdoor route harder than 5.9. 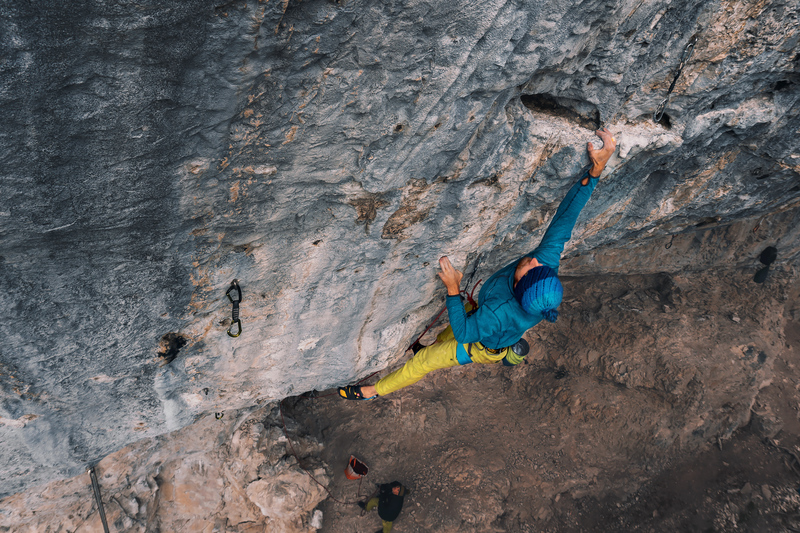 Her big goal for the season was originally to just get 5.10b, and her big pipe dream was to send her first 5.11a. Of course, in classic Jolene fashion, she most definitely superseded her goal by a wide margin. Not only redpointing her first 5.11a in only a couple tries, but also ticking a whole heap of 5.10’s, including on-sighting her first 5.10a, 5.10b, 5.10c and 5.10d. Not bad for a season! There’s no doubt that her 2019 season is going to be even bigger and better than ever. Of course, I didn’t send everything I tried in 2018. But if I did, then I probably wouldn’t have been trying in the first place. After sending Timber, my first 5.13a, I tried a number of other 5.13’s, including a few in the 5.13b/c range. Maybe a lack of motivation brought on by accomplishing all my goals, or because i’m really not strong enough yet, but I didn’t quite get any of them. Fortunately, they are all still there this year, and i’m stoked to jump back on a few of them and hopefully finish them off. Heart Creek is known as a bit of a beginner crag and area, but it is absolutely packed full of hidden gems. The Amphitheatre is one of the best of these gems. 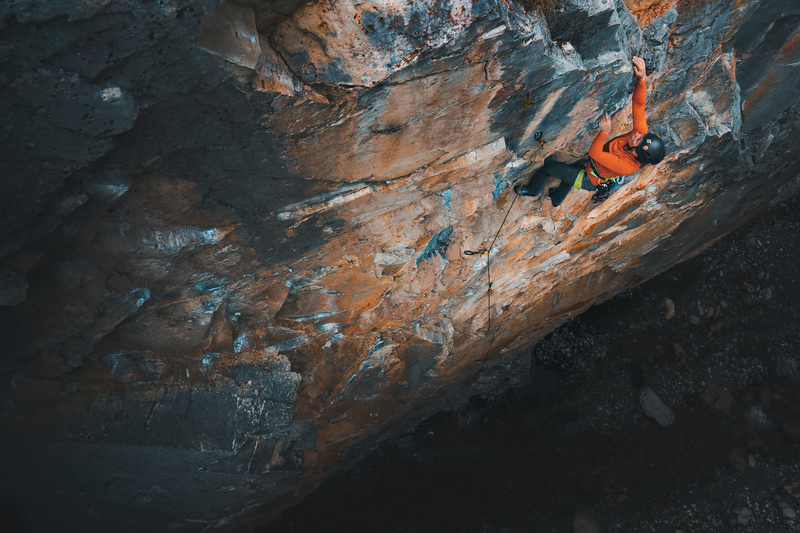 It towers menacingly over Heart Creek and offers a good selection of extremely high quality climbs ranging from this 5.10d classic called the “Slackline King” to harder test pieces in the low 5.13’s. Not to mention the extremely high quality and classic “Convincer”, which certainly convinced me that this impressive wall is worthy of the funky Via Ferrata approach. Crowbar Wall in Cougar Creek is another classic wall that I had been wanting to shoot photos on for quite a long time. Stunning rock, almost perfectly vertical with little overhanging steps the whole way up, and beautiful orange tones. 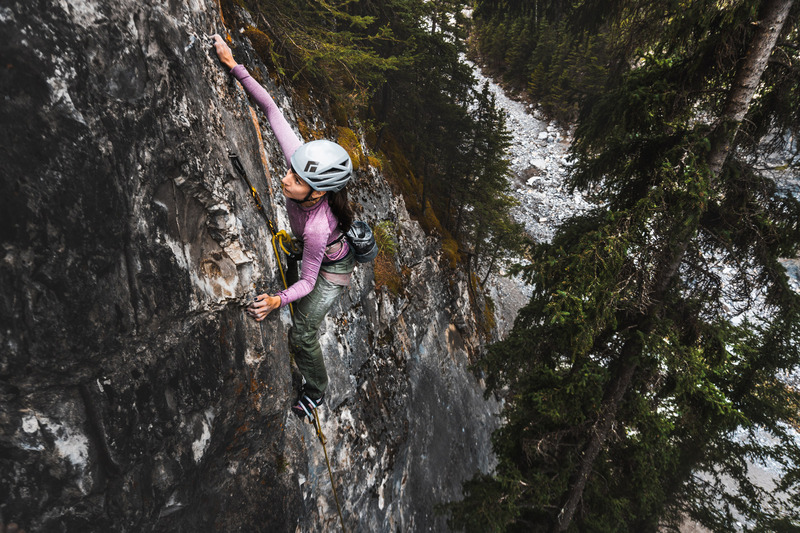 It is the ultimate venue for spectacular cragging photos. Jolene and I met up with Sarah and Matt after Jolene had just sent her first 5.11a. Fortunately for me, Sarah was stoked to try “Fresh Start”, the hardest route on the wall at 5.11d. I quickly climbed the super classic “Critical Mass” and set up to take some shots. This is one of the results. It never ceases to amaze me how quickly something can go from feeling totally impossible, to actually not so bad, and then it goes down. After sending 5.13a earlier in the year, I still wanted to solidify my 7c/+ grade with one more project. “Icebox of Broken Dreams” (5.12d) at Acephale had a brutally difficult start, but the rest of the route wasn’t quite so bad, with a second 5.12a crux near the top that was much more manageable. I knew if I could stick the crux move at the bottom, that the rest of the route would go down. I worked it one day with Eugene and was pretty sure after that session I wouldn’t be able to do the route. But then, a week or two later I went back and suddenly the impossible became possible and I had no problem doing the previously impossible boulder problem at the start. Just like that, I sent the route. I had been dreaming of shooting “The Convincer” in Heart Creek ever since I saw a photo of it in the Bow Valley Sport guidebook. 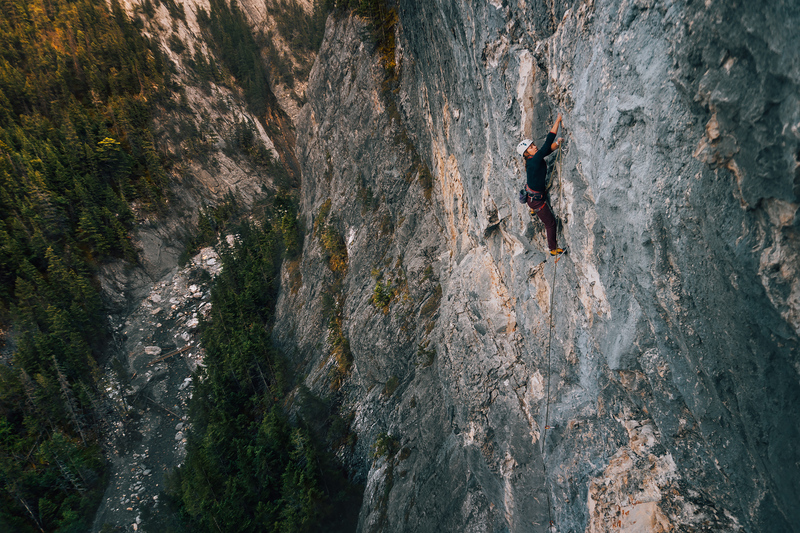 The route rises over 100m from the creek floor, and consists of a via ferrata pitch at the bottom leading to a 32m pitch of damn near perfect 5.12- climbing that towers above. 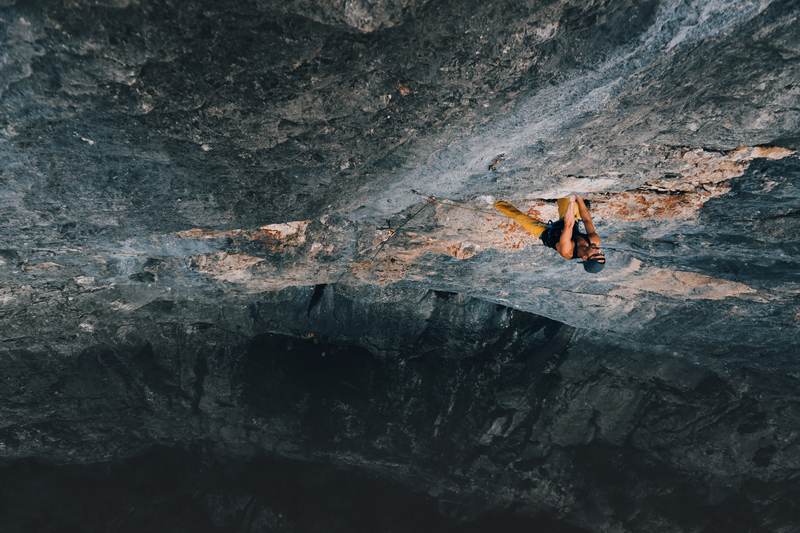 The combination of slightly overhanging climbing above somewhat mellower slab pitches below gives the route an airy feeling – similar to the exposure you would see on the Nose or another El Cap route. This makes the route absolutely perfect to shoot. The day we went out, it was pouring and thunderstorming like crazy when we walked up the creek bed. We were worried that we were going to be regretting our decision to climb here that day, but fortunately, the storm only lasted a few minutes, and the rock was miraculously dry. I quickly re-redpointed this perfection of a rock climbing route, set up the fixed rope and starting taking pictures of Jay climbing. Here’s my favorite from the day. This is Shane, one of my main partners for both the ski and climbing season for 2018/2019. Sadly, he’s leaving to move back to Australia this fall in 2019, but i’m stoked I will get to hang out with him a bunch this summer before he goes. Every so often you find someone that you just jive with. They know how to motivate you in just the right way, and is always stoked to get after it. Shane was definitely that partner, and we ended up spending a whole bunch of days ticking climbs last season and sending some of our dream Couloirs in the Rockies this winter. Adam Fiala claims that his dad is more stoked than he is, even though his dad is in his 60’s. His dad also climbs 5.13+ still, and made a point of sending as many hard projects in the Bow Valley as possible when he was here. Adam, of course in the spirit of his father, is no slouch either. 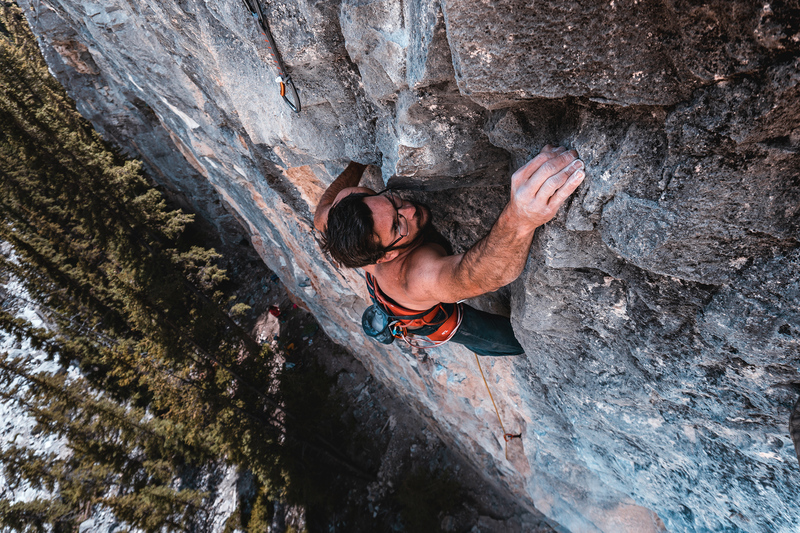 In 2018, despite a finger pulley injury, managed to onsight 8a in Spain, 5.13a here in the Bow Valley, and made relatively short work of Fit Bird Direct, a benchmark 5.14a at the Coliseum. Adam is a beast, and he’s also a solid friend and great climbing partner. Always stoked, encouraging, and makes you feel awesome about yourself even though the guy can climb harder than almost anyone else at the crag. Adam Fiala warming up on “Altius”, (5.12c) at Acephale.